Moving doesn’t have to be stressful. Especially when you are moving to a new city. Spaces is here to help make your move smooth and easy. We offer simple solutions so you are not left wondering why the movers are late and how much it is costing you. Our team of professional drivers deliver our storage containers throughout the Kingston area going as far east as Ottawa and as far west as Trenton. Contact us and we would be happy to supply you with a reasonable quote for your long distance storage needs. Do You Dread The Thought of Packing? With Spaces long distance moving is always in your control. We will deliver our portable storage containers to your home along with any packing supplies you may need. You pack the container at your own pace, give us a call and we will come take it away either to your new location or to be held at our secure facility. Let Spaces Storage help you through your next move and avoid any unwanted surprises. Don’t get lost in the sea of competitors; let Spaces organize your move at a fair price and save even more money when you pack it yourself. Avoid the hidden fees and gimmicks that usually accompany long distance moves by choosing us! We will quote you a fair price before we begin so you are aware of all costs going into your move. We won’t surprise you with hidden fees for gas or kilometers travelled. The price we quote is the price you’ll pay. 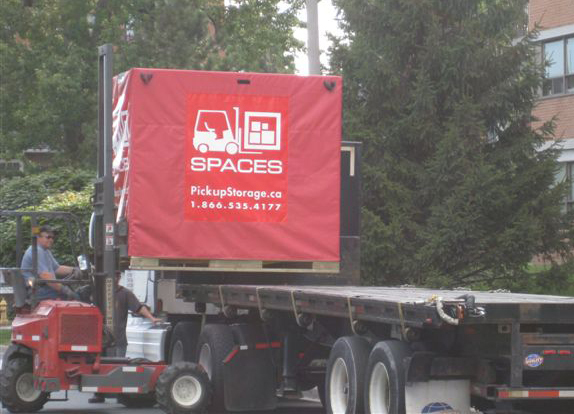 Our storage containers make it easy to move long distance. They are conveniently sized and easy to load at ground level. Call us today at 613-544-7319 and one of our team members will be happy to help you plan your next long distance move.